As Matt Gonzalez once argued, when it comes to Gavin Newsom, we should fight him when he is wrong and support him when he is right. And finally, Newsom’s talk about free Muni is on the right track. Before Newsom’s announcement, free Muni was a radical idea that was not thought possible in the near term as most proposals centered around providing less expensive service to our most vulnerable citizens. The Mayor has been testing the waters regarding this issue; it seems that his conservative backers are not willing to challenge him and liberals are wary of expressing their support in an election year. But this is the prime moment to make such an environmentally and socially progressive move. The basis of the idea lays in quite simple math: the Metropolitan Transit Authority (MTA) only collects 18 percent of its funds thought fares while spending the same amount on fare collection. Furthermore, the City is preparing to make strenuous efforts to amp up its collection rate including expensive, high tech initiatives such as TransLink. For free Muni to work, it would be best to make the switch before precious funds are spent on such infrastructure buildups. Talk of lowering the cost of Muni is not new. Matt Gonzalez’ 2003 Mayoral platform included free Muni for those under the age of 18, and just this year the San Francisco Youth Commission led a successful drive to get the cost of Fast Passes for 18-21 year olds lowered. The overriding problem with these proposals was that they did not lower Muni’s costs. A free Muni does pose serious, yet workable problems. 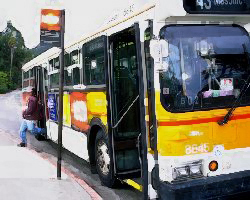 The primary concern is that with no fares, the number of rides demanded of the Muni system would rise; current budgets do not allow for an increase of services. In addition, higher Muni ridership would mean less cars which in turn means less fees related to driving collected by the City. A second major concern is Muni patrons treating the system as a worthless enterprise, or as some critics have stated, become mobile trash bins. The concerns here are twofold. First, that mistreatment of Muni would make the system unattractive, and secondly that the MTA would have to spend additional funds on maintenance. However, the MTA would have some funding options. There is the $3.5 million cost which is expected to come with the 18-21 year old discount passes which could go towards increased services and maintenance. Also, one major use of collected fares—paying BART for intra-city transit would be gone. With time it can be expected that the MTA will need additional funds to finance a free Muni. While perhaps this is wishful thinking, it is not too far-fetched that, after seeing the benefits of free transit, San Francisco voters would approve of some sort of revenue source to fund Muni. As Muni usage rises with the elimination of fares, perhaps we will finally see an entire community realize that the responsibility to support an environmentally sound and practically efficient system is a responsibility shared by all. There is a political responsibility, too, for civic leaders to jump on the opportunity that the Mayor has created to make these once fanciful proposals a reality. It is a reality that a combination of personal feuds and legitimate projects could derail movement for a free Muni, but it is one which coexists with the reality that the political fruit for leading the way on such an issue would be worth the struggle.